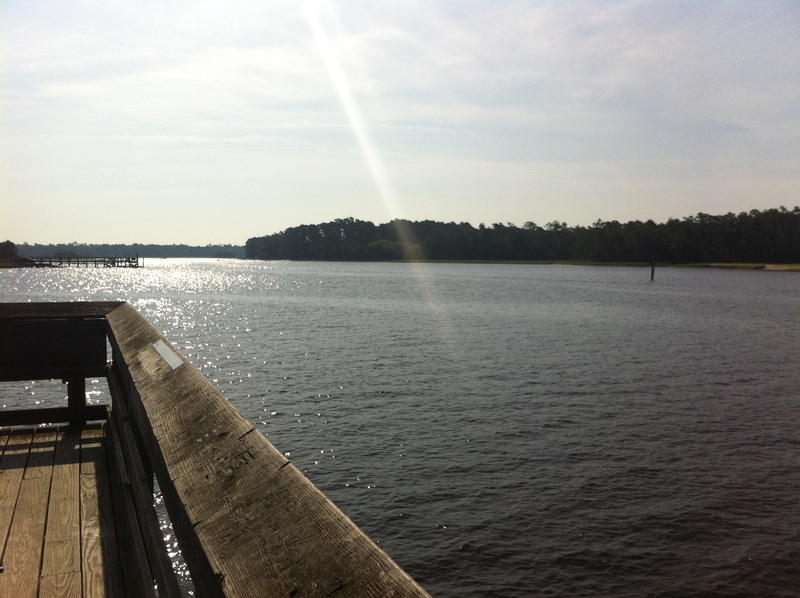 Myrtle Part 2: Southern Eats! My vacation to Myrtle Beach was more focused on relaxing and enjoying the weather than it was about being a foodie adventure. My roommates and I had a plan to save some money by grocery shopping and eating at her family’s house for a handful of our meals. However, when we did go out to eat, I wanted to make sure to try some good southern eats! We spent a night walking the boardwalk when we went to this place called Sharkey’s. We sat on the roof overlooking the boardwalk and the beach as the sun was setting giving us a really incredible view. Service here was slow as were most of the attitudes we came across. To me, everything felt slow as molasses down there- table service, people walking across the street, conversations slowed down- but apparently that’s just what life is like in the South. 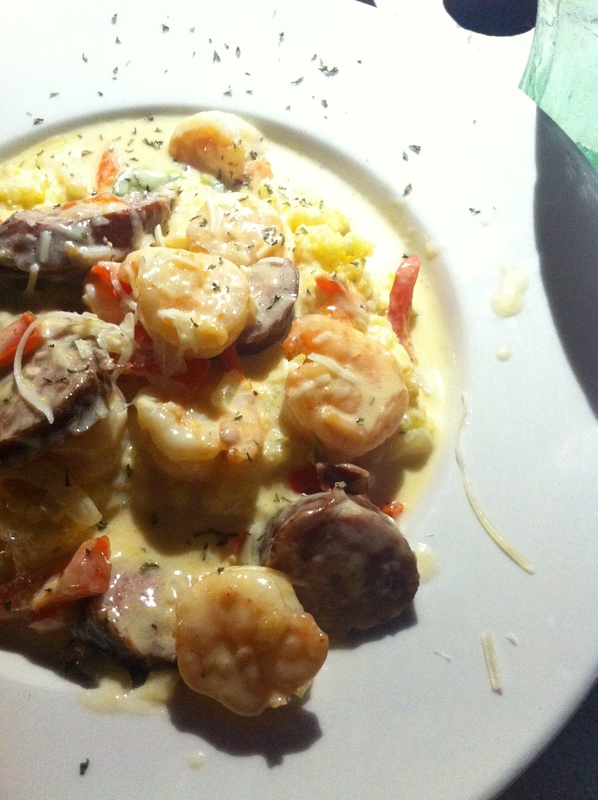 I ordered the shrimp and grits! The grits were bacon infused as also came with sausage pieces as well. YUM! Once we finally got our food, the grits were nice a smooth, a little smoky and salty which was so delicious with the shrimp and sausage. The food was rich and filling so I ended up taking home half of my dinner for lunch the next day. Another night we visited a place called Duffy Street Seafood Shack. My roommate Allie ordered the king crab legs while I just got the bacon cheeseburger which came with slaw and old bay fries. We split an order of sweet cornbread which was the best I’ve ever had! It was almost like a cake- light and fluffy, sweet but still savory. I scarfed that down in just a few minutes and I keep dreaming about it- I need more! I was disappointed with my burger- I almost got the appetizer crab cake claiming to have been made with very little breading and lots of lumpy crab meat but I panicked when ordering and went with the burger instead. We also ordered one of their signature drinks- Orangeade and vodka! Surprisingly, the orangeade brought me back to elementary school Summer Playground where we would have a drink break and get either lemonade or orangeade. I forget it even existed! 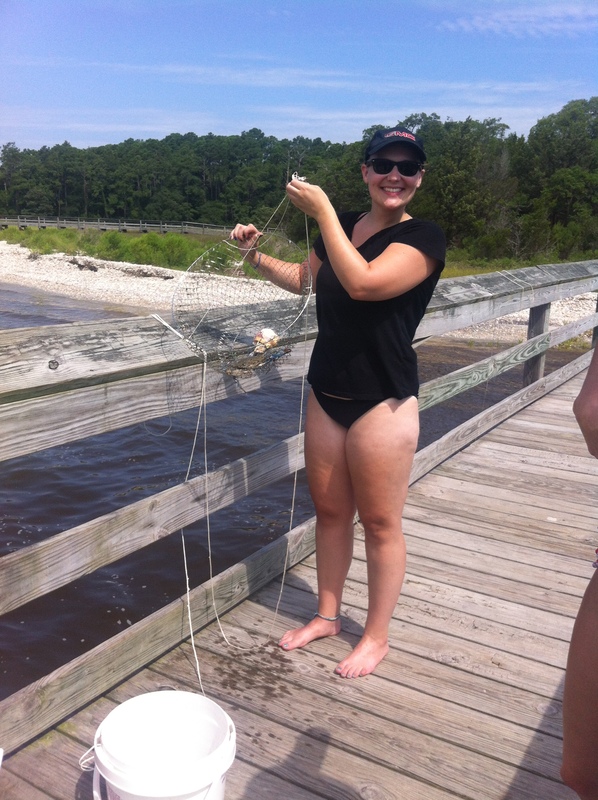 My absolute favorite part of the trip however was when we went crabbing with Allie’s dad. We woke up and went to a deserted pier around 9 in the morning with all of our gear in hand- a handful of crab traps, a couple fishing lines, our bait and tackle box, a drink cooler and oodles of sunscreen. The traps work through tension. Sitting on the ground, all four sides of the box are open with the bait (raw chicken) wired inside. 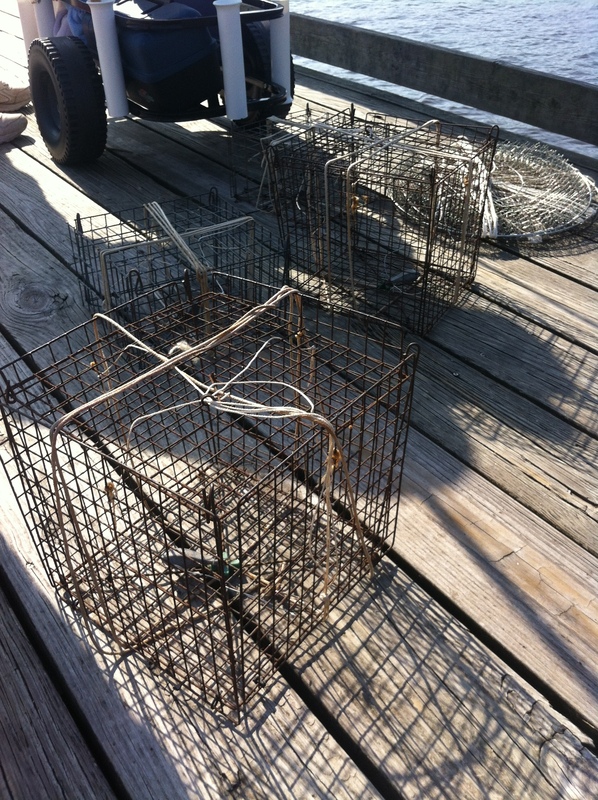 The crabs would then come to eat the bait and periodically you check the traps by pulling up tightly and quickly on the string. The four sides of the box close up trapping the crabs inside! We had to throw many of them back if they were too small as we were only allowed to take crabs that were 5 inches tip to tip. 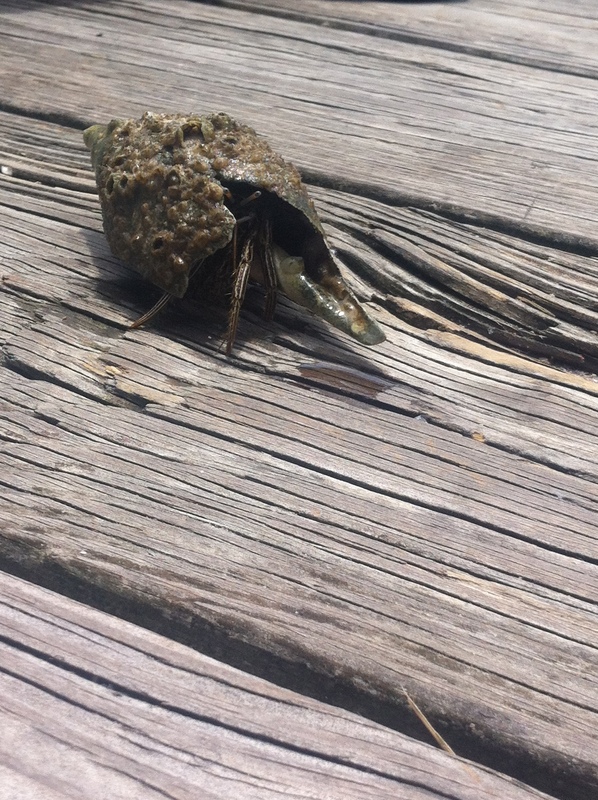 Over the course of four hours, we caught 11 crabs, one pregnant crab, and a hermit crab and a couple miscellaneous shells. We took our haul back to the house where we started boiling a pot of water. Once the water is boiling, you drop them in one by one and cook them for about 12 minutes before pulling them out. Their color is completely changed and once cool, they’re ready to be cleaned. 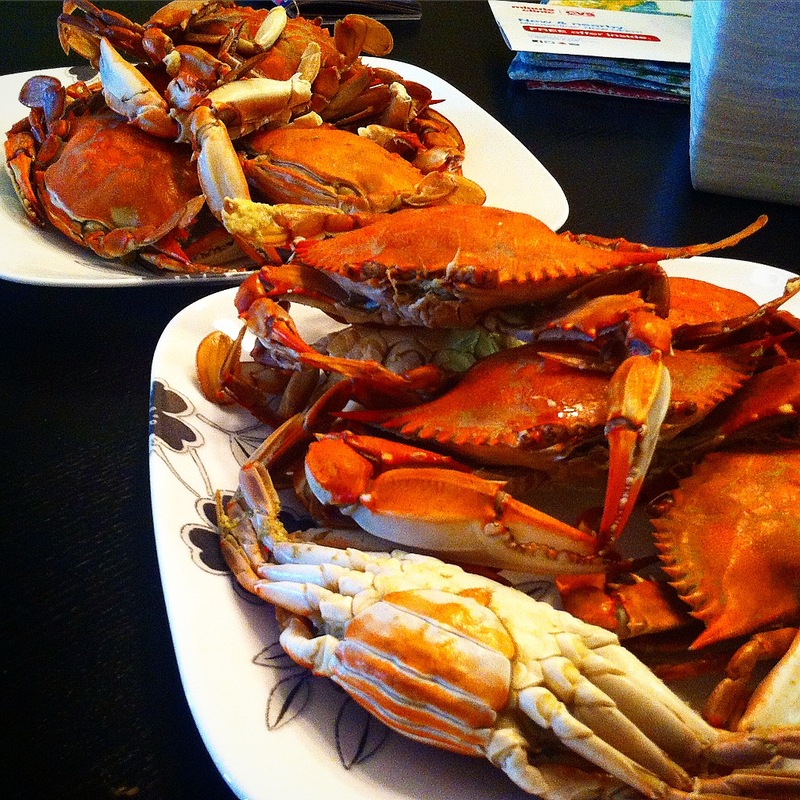 To clean the crabs, you must first pull off the bottom part of their shell to reveal the insides. At this point you have to take out the crabs lungs and all the other colored parts (yellow, green and black mush) and rinse them clean. Then they’re ready for picking! Although our crabs were small, the meat was well worth the reward!! So sweet and delicious, we melted butter to dip them in. We spent about an hour and a half each picking and eating only 3 crabs but it was WELL WORTH IT. It was so great to be able to say I was eating the fruits of my labor. 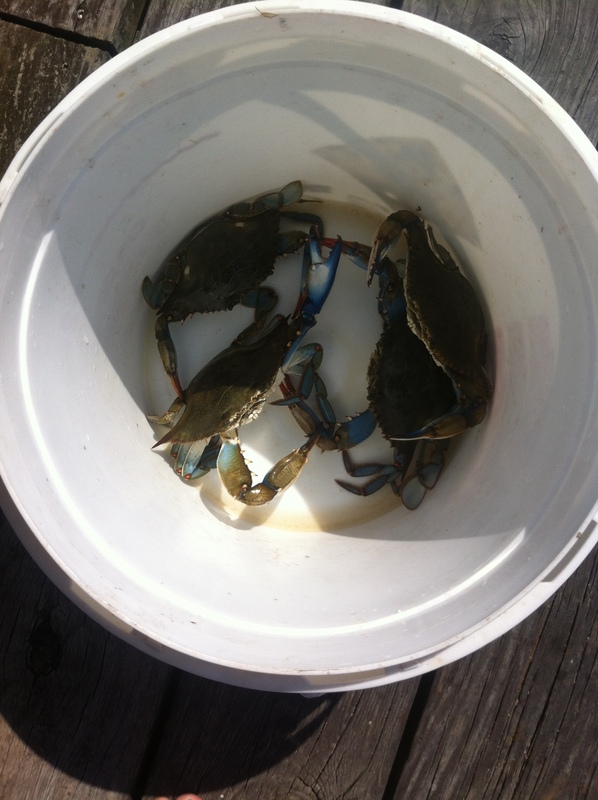 I’ve never been a huge outdoorsy type, but I had a blast crabbing! Have any of you ever done this before? What should I try next? Hope you all have an incredible weekend planned in this gorgeous weather but don’t forget to check back on Tuesday! Until then!